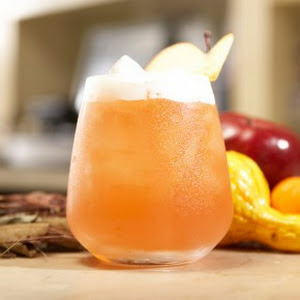 Combine all sliced fruit, ginger root, cider and Grand Marnier in mason jar or other resealable container. Refrigerate for two hours. After two hours, remove and discard the ginger root. 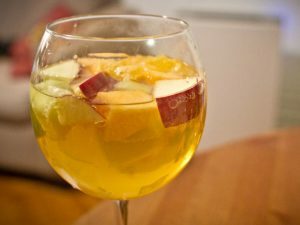 Pour the fruit and alcohol mixture into a pitcher. Add 2 cups of ice to mixture. Trim and discard the excess skin from underneath each chicken thigh, then season with salt and pepper. Heat the olive oil in a wide shallow frying pan or sauté pan with a lid, put the thighs in the pan skin-side down, then leave to brown for 5 minutes. Flip them over and brown lightly on the other side, then lift onto a plate and drain away any excess fat, leaving just a little in the pan. Fry the bacon until lightly golden. Add the garlic and stir briefly, then stir in the pearl barley, Perry and chicken stock and bring to the boil. 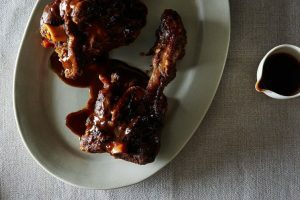 Return the chicken thighs skin-side up, cover, lower the heat and simmer for 20 minutes. Add the carrots, cover and cook for 10 minutes more. Meanwhile, melt the butter in another pan. Add the leeks and cook for 2-3 minutes until starting to soften. Uncover the chicken, stir in the leeks and simmer, uncovered, for 5 minutes. 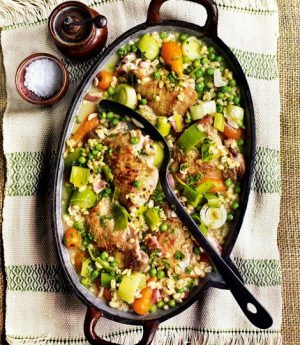 Add the peas and simmer for another 5 minutes until the chicken, pearl barley and vegetables are tender and the liquid has reduced nicely. Add a splash of Perry, taste and add a little more if needed. Scatter over the parsley, squeeze over the lemon and serve. To prepare fruit compote/reduction, preheat oven to 400 degrees F (204 C) and add cranberries, pear, orange zest, water and maple syrup to small baking dish. Toss to combine. Bake for 20-22 minutes or until the fruit is bubbly and most of the cranberries have burst. Transfer mixture to a food processor or small blender and blend/mix on high until a compote consistency is reached. If needed, add more water to thin. Taste and adjust flavor as needed, adding more orange zest for citrusy flavor or maple syrup for sweetness. Transfer the compote to the refrigerator to chill – about 30 minutes to 1 hour or until cool to the touch. 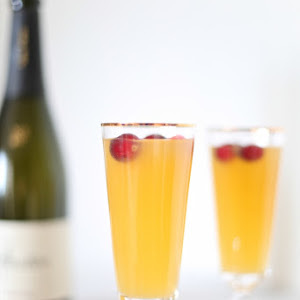 To serve, add about 2 Tbsp of the compote into serving glasses (champagne flutes are ideal). Top with a bit of Perry. Then use a spoon or stirrer to blend the two together. This will help the fruit mix with the Perry more seamlessly. Top with more Perry until the flutes or glasses are 3/4 full. Enjoy immediately! You will likely have leftover compote, which will keep for 1-2 weeks in the refrigerator. Place ham in a large pan and add half of the perry and enough water to cover the ham (don’t worry if hock isn’t submerged). Cover with plastic wrap and refrigerate overnight. Remove ham and discard the liquid. 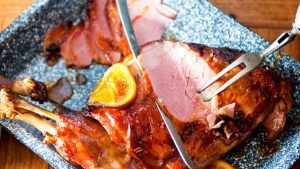 (Alternatively, if you have the time and energy, reduce it down and use it, along with the pan juices, to baste the ham as it cooks). Preheat oven to 160°C. Pour remaining Perry into a saucepan, add blade mace, sugar and orange juice. Bring to the boil. Reduce heat and simmer for 10 minutes or until liquid reduces by one-third, then add mustard powder. Place ham in a roasting pan and pour over Perry mixture. Layer orange slices over the top. Cover ham with foil and bake, basting regularly with pan juices and removing foil halfway, for 2 hours or until ham has warmed through and liquid is starting to thicken. Transfer ham to a plate and cover to keep warm. Place roasting pan over medium heat and cook for 5 minutes or until the liquid is thickened. Strain, then spoon sauce over hot ham and serve as part of the Christmas spread with warm potato salad and a glass of something good. 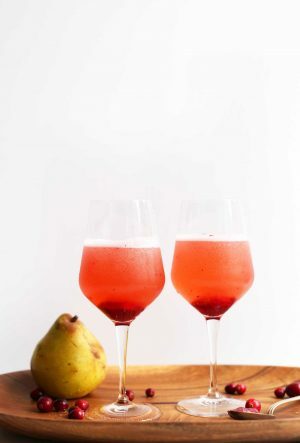 Combine juice and cider. Stir. Slowly add sparkling wine and serve chilled. Whisk flour, salt, black pepper, coriander, cumin and cinnamon together. Roll the lamb shanks in the flour mixture until they are coated. Heat a frying pan over medium-high heat and sear the lamb shanks on all sides until a good crust forms, this will take 8 to 10 minutes total. Transfer lamb shanks to a plate and preheat your oven to 160° C.
Scrape any crusty bits from the lamb-searing off the bottom of the frying pan (don’t discard, just scrape them up to loosen them and prevent them from burning). Place the frying pan over medium heat and add the garlic, onion, carrots, celery, rosemary, thyme and orange zest. Cook, stirring occasionally, until the onions are soft and translucent, 10 to 15 minutes. Place the lamb shanks into a casserole pot and pour the Perry and chicken stock over them. Season the broth with salt to taste, cover the pot and place it in the oven until the meat is very tender and falling off the bones, about 2 1/2 to 3 hours. Remove the shanks from the pot, covering them with foil to keep them warm and strain the liquid into a saucepan. Discard the solids. Add all the ingredients except the cider to a shaker and fill with ice. Shake well and strain into a double Old Fashioned glass filled with fresh ice. Top with the cider and garnish with an apple slice and a sprinkle of grated nutmeg. 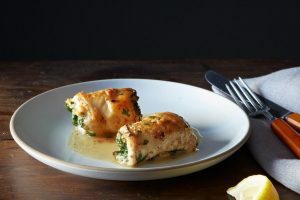 Use a mallet or rolling pin to pound and flatten the chicken breasts. I place each breast between pieces of plastic wrap. Make the breasts as thin as possible, but try not to tear the breasts – 1/4 inch is a good thickness to aim for. You are going to slice each flattened breast in half. With the “smooth” side of the breasts down, lightly season the breasts with salt and pepper. Then, divide the garlic and herbs into eighths and sprinkle each breast half with an eighth of the garlic and herbs. Shape each tablespoon of butter into a cylinder and place in the centre of the breasts. The goal is to wrap up the breasts so the Kievs are as airtight as possible to keep the butter from leaking out during cooking. I fold over the breasts on the sides first and then top and bottom. Dust the Kievs in flour, very lightly and then place them in the refrigerator for at least 30 minutes so they can firm up. You may want to use toothpicks to keep the Kievs intact. Take them out of the refrigerator about 30 minutes before you are ready to brown them. Heat the olive oil in a large skillet over medium heat. Using tongs, place the Kievs in the skillet and brown nicely on all sides, including the tops and bottoms of the Kievs. I find that some of my Kievs have 3 sides; others – 4 sides – in addition to a “top” and “bottom”. The browning may take about 15 minutes. Place the Kievs in a 300°F oven while you make the sauce. If you find that some of the Kievs have released their butter, that is fine – it happens all the time. To the skillet, add the Perry and scrape all the good bits into the Perry. If you need to add butter to the sauce, just a small pat will do. Reduce the sauce until it is nicely brown and shimmering. Taste, for a little brightness, you may want to add a tiny bit of lemon juice. 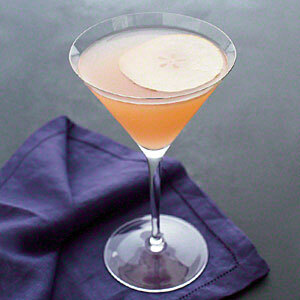 Combine pear juice, vodka, pomegranate juice, lime juice and agave syrup in a martini shaker with ice; shake. Strain about 3 tablespoons of the vodka mixture into each of 2 martini glasses. Top each serving with 1 1/2 tablespoons cider. Garnish with pear slices, if desired. In a large bowl add all of the ingredients. Mix to combine. Roll into 1-inch balls. Place the meatballs on a cookie grate on top of an aluminum foil lined baking sheet. Bake for 20 minutes. In a small bowl add all of the ingredients, except the scallions. Whisk to combine. Add the mixture to a large sauté pan over medium heat. Bring the mixture to a gentle boil and let simmer for 2 minutes until the glaze thickens. 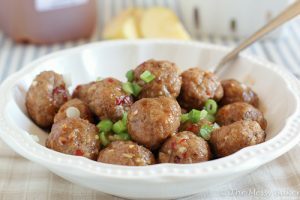 Add the meatballs to the pan and let cook for 1 minute to coat. Top with chopped spring onions. Note: After shredding the pear, place in a paper towel or clean kitchen towel and squeeze out juice.